Publish the Vegetarian News and leaflets. We serve free vegetarian food to needy and homeless persons in Nigeria and other countries in Sub-Sahara Africa. The Nigeria Vegetarian Society takes part in the International Meatout Day on March 20 each year. Plant - based meals are served free to homeless persons and Meatout leaflets are distributed to the public to highlight the devastating impact of depending on Animal based foods to feed the teeming population. Held on October 2 to highlight the devastating impact of Animals agriculture on the Environment, Animals and Human Health. The events also mark Mahatma Gandhi Birthday regarded as patron of Animals. 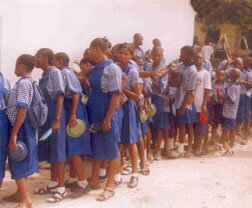 The Nigeria Vegetarian Society give talks in schools and meatless meals are served to the public. SEVAOUTREACH is a hunger relief and charity initiative of the Nigeria Vegetarian Society [NVS] which serves free vegetarian food as well as render humanitarian support to needy and homeless persons in Nigeria. . SEVAOUTEACH does variety of humanitarian services such as food relief, clothing distribution, water supply and sustainability projects. 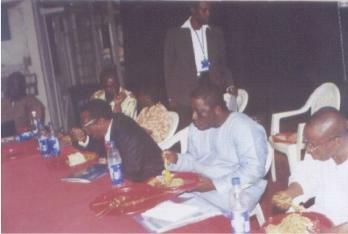 SEVAOUTREACH began in 1997 to serve free monthly food to destitute at the Oshodi Railway line in Lagos. Later in that year, Park ‘n’ Shop supermarket donated food items to be distributed to homeless persons on the Indian festival of Diwali. The company later requested SEVAOUTREACH to be collecting food items from their warehouse and distribute to homeless persons. In year 2000 two companies Metro Group and Limca Bottlersco- sponsored feeding the homeless on Earthday 2000 – an event in which several hundreds of homeless persons were fed free food. Since that humble beginnings, SEVOUTREACH has grown to become a well-known hunger relief project attracting local and international support and commendation. The project took a new dimension in 2005 when with funding support from HIPPOCHARITY (UK), GreenAngels (Poland), Food For Life Global (USA) and the Sathya Sai SEVA organisation in Nigeria we went to Niger Republic to serve free food in response to the drought and famine in that country. SEVAOUTREACH receive donation of funds and foods items from individuals, companies and organizations and in turn cook and serve healthy and nutritious plant-based food to homeless persons in several locations. By popular request, SEVAOUTREACH keep a list of various social welfare organizations that require assistance in various ways for their subsistence. SEVAOUTREACH events can be arranged anytime, any day, personal and on special occasions. SEVAOUTREACH is organizing free feeding for homeless & hungry people in Nigeria & Sub-Sahara Africa and is therefore soliciting for your generous support. Feed The World Week is an open community event held worldwide. Feed the World Week is based on a simple principle. For one week the should experience a wholesome, non violent, karma free diet and thus pave the way for a peaceful and hunger free world. The events in Nigeria is coordinated in partnership with the Hare Krishna Food For Life and Local Supporters. Free Vegetarian Food is served free to thousands of needy and homeless persons in many locations in Nigeria. Other organizations and individuals wishing to take part in the Feed the World Week should please contact the society. The Feed the World Week is coordinated by Food for Life Global the largest Vegetarian /Vegan Charity in the world. Food for Life is an affiliate project of Hare Krishna Movement. November 25 is the international meatless day founded by the Sadhu Waswani Mission. In 1999 the Nigeria Vegetarian society hosted Dada .P. Vaswani when he visited Nigeria. We hope to have a partnership programme with the group to be marking the event in Nigeria. Since 1994 the Nigeria Vegetarian Society has been holding an annual National Vegetarian Day Celebration in December each year. Vegetarians and many groups all over the country have been taking part in the annual Vegetarian Day Celebration. The event is normally held at the Hindu Mandir Foundation/India Cultural Centre.